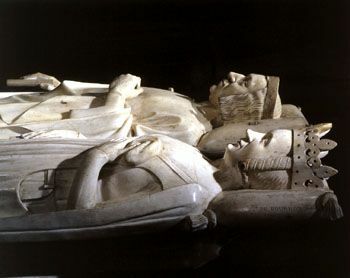 Charles V, king of France from 1364 to 1380, and his wife Jeanne de Bourbon. King of the Valois dynasty. Charles V and his wife Jeanne de Bourbon, the first statue of a French king taken from life. White marble. At the age of 27, king Charles V (known as the Wise and a great patron of the arts) commissioned his funerary statue from André Beauneveu, one of the most celebrated sculptors of the age. This is doubtless the first official portrait in the history of funerary statuary and is one of the finest masterpieces of medieval sculpture.